From computers and tablets to bar code scanners, printers, monitors and servers that have been sitting in warehouses steadily depreciating in value, today’s companies must find a way to dispose of a wide variety of inoperable, obsolete or decommissioned IT equipment. Unfortunately retiring these assets responsibly can be maze of confusion and red tape. Often it takes multiple vendors to handle shipping, packaging, storage, inventory, data destruction, logistics and disposal/recycling – not to mention sorting through all the Federal, State and local regulations that govern electronic waste. Our qualified staff handles the logistics, project management and all other aspects of your end‐of‐life technology retirement. We understand that each company has unique needs. So whether you have 1 office or 1000, e-Waste has a solution that is 100 percent customized to suit your business needs. We understand the complexity of transporting your end-of-life technology; that’s why we offer an array of options to help ease the burden. Do you need LTL (less than truckload) transportation? No problem. 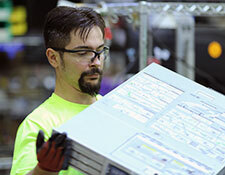 Looking for full-service onsite packing and palletizing of your electronics? We’ve got you covered. With our innovative “e-Crate” system, simply place your electronic equipment into the e-crate container we ship to your door. We’ll take it from there. Whatever your needs and challenges, we’ll design and execute a plan that fulfills your IT asset retirement goals. From the moment we pick up your technology assets, e-Waste provides online tracking to ensure that every item is thoroughly accounted for. From your facility, to our loading dock to arrival at the final destination, we’ll keep track of all your assets. And when the job is done, we’ll provide you with a detailed audit report and a certificate of destruction documenting the entire process for your internal records.